Truth be told, I've been in a terrible mood all weekend and basically been having my own little "woe-is-me" pity party, which was dumb. I'm terrible at being injured and I get extremely frustrated when I can't do things. I take all this frustration and anger and start projecting it on everything else and end up in a bad mood - it's completely ridiculous, unnecessary, and childish. I'm lucky that I am able to do things with this injury, even if it does mean a week full of power cleans and kettlebell swings. It was safe to say that I was an absolute joy to be around this weekend with all of my self-loathing, moping, and general anger. Thank goodness my husband has learned to deal with it. What does this have to do with chili? Well, all I was craving this weekend was comfort food and a bowl of chili. 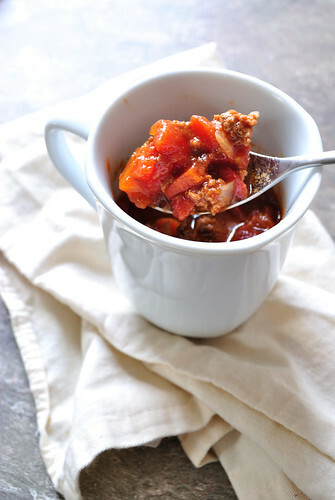 I haven't made chili in quite awhile and I didn't want to spend a long time in the kitchen so I whipped up this quick and easy chili. 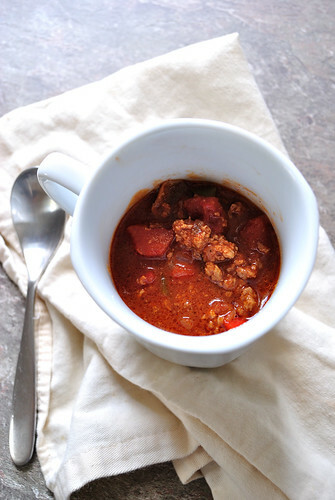 This chili is one of the easiest chilis I've made simply because it just involved throwing whatever I had in the fridge into a pot, and then into the crockpot to cook while I did other important tasks...like laundry and watching Netflix. I will confess that I wasn't super precise with my measurement for this recipe and really, I rarely break out any sort of measuring tool except when I'm baking. I like to cook by feel and sight and have a pretty solid idea of what 1/2 cup and 1 tablespoon looks like so I just throw things together and hope for the best. Luckily, this chili came out amazing. It's guaranteed to break any bad mood.